Clinical presentation and management of hand joint arthritis related to excessive cellular phone use. Department of Orthopaedic, Hospital Cruz Roja, Avda. Reina Victoria 22-24, 28003, Madrid, Spain. Department of Orthopaedic, Clínica CEMTRO, Madrid, Spain. Introduction: New technologies have been related to upper limb diseases Trapeziometacarpal osteoarthritis in young patients has not been described yet as one of these “overuse pathologies”. 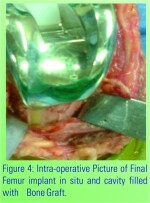 Case Report: We present two cases. 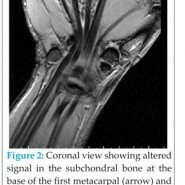 A 33 and a 32 year-old women, right handed, suffering from trapeziometacarpal pain. Neither previous trauma nor rheumatic disease was reported. Excessive use of last generation cellular phone was the only background reported. Pain and joint crepitation were found on physical examination and osteoarthritis signs were seen on MRI scans. 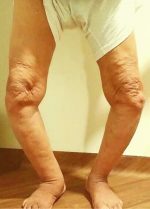 One of the patients improved after using a cast, physical activity restrictions and a specific rehabilitation program; whilst the other required a corticosteroid joint injection. Conclusion: We warn about the potential growth of these pathologies caused by an indiscriminate use (or abuse) of touch-screen cellular phones. 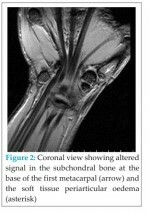 Keywords: Hand, Trapeziometacarpal joint, Cellular phone, Osteoarthritis.